Obviously, it’s your car and you can do whatever the hell you want with it, as long as you aren’t endangering anybody. You are entitled to that. But since you bring said car out on public roads where I, a member of The Public, can see it, I am also entitled to this opinion: That all bumper stickers are stupid and should never have been affixed to a car in the first place. And second: You have a message that you want all the other motorists behind you to know. It’s certainly not something you feel the need to read or see over and over again, because otherwise you’d stick it on your dashboard or something. 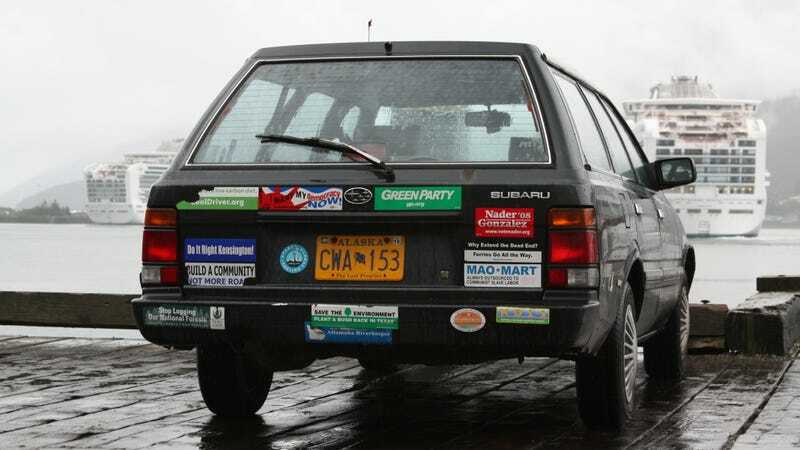 No, bumper stickers are solidly for the sake of other people, but here’s the thing: Nobody cares about what you think or believe when they’re motoring down the road. Nobody is impressed that YOU WENT TO PRINCETON WAHOO THERE’S A SMARTIE HERE AT THE WHEEL. You are making yourself a target for unnecessary scorn, ridicule and judgment from people like me. You don’t care what other people think of you, you say? Well, what if your bumper sticker translates into how you are treated on the road? What if someone just hates poodles or the fact that your child is a middle-school honor roll student, so they feel justified in cutting you off? That they have rationalized not letting you merge because you’ve been handed enough with your fancy Ivy League education? That you’ve been to Martha’s Vineyard far too many times, so you’ll be able to survive some tailgating? You’ve given too much of yourself away to these crazies, my friend. The more anonymous on the road you are, the better. It saves you from so much unnecessary attention. I’m sorry to disappoint you, but your bumper stickers are not clever, funny or particularly introspective. Don’t even get me started with those “Baby On Board” stickers. I’ll let Carlin handle that one. And, I mean, they just look so sloppy. A clean and unmarked rear of a car is a sight to behold. A designer somewhere actually spent time trying to make it attractive and here you come, armed with a sticker and questionable taste, and wham! Right there, right on top of their work. Why don’t you just spit on the car while you’re at it. Stickers everywhere! All shapes, sizes and colors. It’s too much! I am aware this is a petty take. But I do believe in law and order on our roads, and I also believe that getting there involves banning bumper stickers. You want to express your individuality? Buy a car that does that. Then leave the back of it the hell alone.